News Archives - Photothermal Spectroscopy Corp.
Santa Barbara, Calif. – December 1, 2018 – Photothermal Spectroscopy Corp, the pioneer in Optical Photothermal IR (O-PTIR) spectroscopy, has been announced a winner of the 2018 R&D 100 Awards. 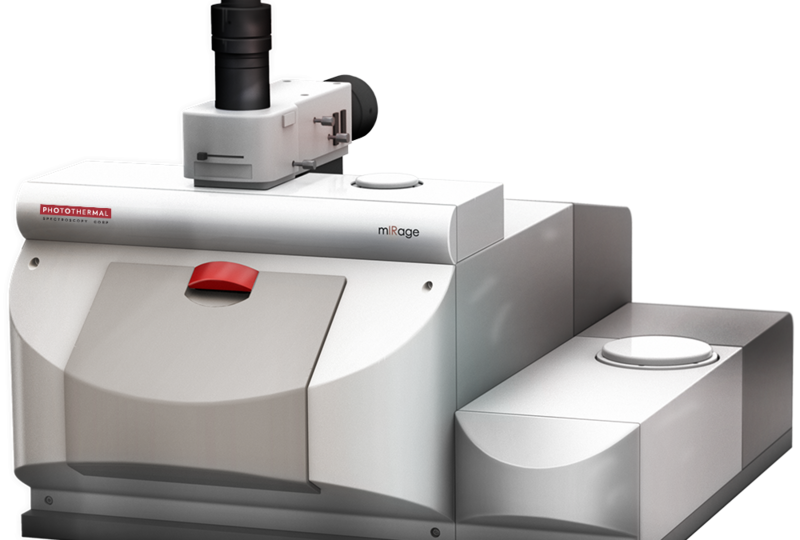 Photothermal Spectroscopy Corp’s product, the mIRage IR Microscope, was developed in mid-2017 and launched at the SciX Conference in Reno, NV in October 2017. The system is the first of its kind, utilizing Photothermal Spectroscopy Corp’s proprietary technology, Optical Photothermal IR (O-PTIR) spectroscopy. Photothermal Spectroscopy Corp (PSC) is a spin-off from Anasys Instruments Corp, the company that pioneered the field of AFM-based photothermal IR spectroscopy (PTIR) and was eventually acquired by Bruker Nano. PSC now has a breakthrough optical PTIR (O-PTIR) technology that eliminates key limitations of traditional IR Spectroscopy: spatial resolution and sample preparation. O-PTIR provides sub-micron spatial resolution for IR and provides transmission-like FTIR quality spectra in non-contact reflection mode. O-PTIR provides all the benefits of ATR without contact-related limitations, and also provides Raman-like spatial resolution, but with IR sensitivity. PSC’s vision is to enable the power of IR spectroscopy to be applied to high value problems in industry and academia via the adoption of O-PTIR. The mIRage IR microscope provides true sub-micron IR spatial resolution imaging and spectroscopy using Optical Photothermal IR (O-PTIR) spectroscopy, a proprietary technique. mIRage provides wavelength independent spatial resolution, highly sensitive IR measurements and transmission quality absorption spectra in refection mode. mIRage bridges the gap between conventional IR microspectroscopy and AFM-based nanoscale IR spectroscopy. Photothermal Spectroscopy Corp, the pioneer in Optical Photothermal IR (O-PTIR) spectroscopy, announces its first applications office in the Asia Pacific region, located at the Tegent Scientific Co. Ltd. Headquarters in Hong Kong. The lab will serve as the flagship office for research and sales in the Asia Pacific region. It will be managed by Dr. Mike Lo, the regional Applications and Business Development Manager. Since its establishment in April 2018, Photothermal Spectroscopy Corp has seen widespread excitement and acceptance of O-PTIR. The technique solves two of the biggest problems in IR spectroscopy: submicron spatial resolution down to 500nm without contact limitations of ATR, and spectra on thick samples in non-contact mode that correlate to Transmission FTIR. To schedule a demonstration of mIRage, contact Jacky Yau at [email protected]. Photothermal Spectroscopy Corp (PSC) is a spin-off from Anasys Instruments Corp, the company that pioneered the field of AFM-based photothermal IR spectroscopy (PTIR) and was eventually acquired by Bruker Nano. PSC now has a breakthrough optical PTIR (O-PTIR) technology that eliminates two fundamental problems with IR Spectroscopy: spatial resolution limitations, and sample preparation. O-PTIR provides sub-micron spatial resolution for IR and provides transmission FTIR quality spectra in non-contact reflection mode. O-PTIR provides all the benefits of ATR without contact-related limitations, and also provides Raman-like spatial resolution, but with IR sensitivity. PSC’s vision is to enable the power of IR spectroscopy to be applied to high value problems in industry and academia via the adoption of O-PTIR. Santa Barbara, California – Photothermal Spectroscopy Corp announces the mIRage IR Microscope, changing the field of IR spectroscopy by solving two of the biggest problems facing the field of IR microscopy, achieving submicron spatial resolution and measurement of thick samples in reflection mode without the contact limitations of ATR, and without dispersive artifacts. mIRage achieves sub-micron spatial resolution IR imaging and spectroscopy, with a spatial resolution improvement of over 20X. 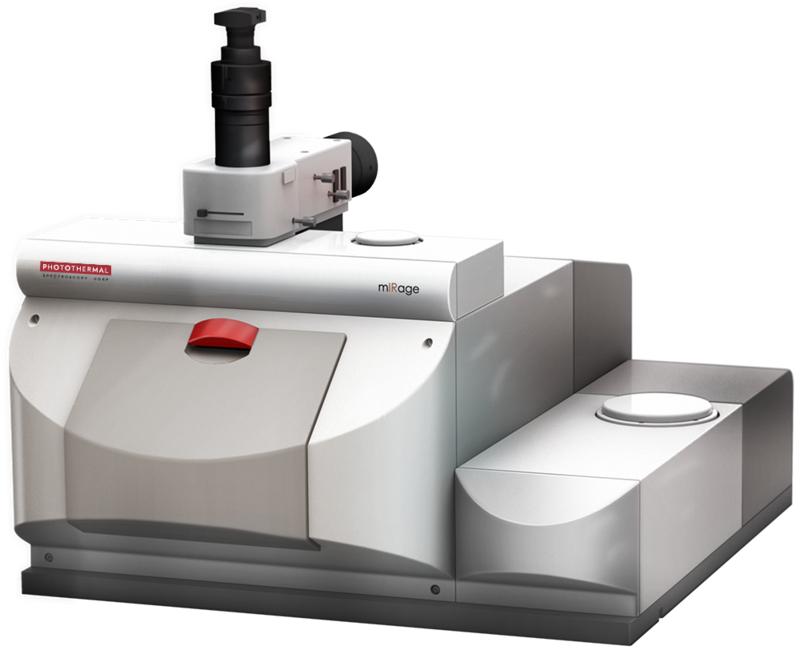 mIRage works on the principle of Optical Photothermal IR (O-PTIR) spectroscopy providing transmission quality FTIR spectra, even in reflection mode. Using O-PTIR eliminates another longstanding limitation for IR microscopy, namely the inability to work on thick samples. mIRage allows IR spectroscopy of surfaces without the contact limitations of ATR, thus expanding IR to many new applications. mIRage obtains IR spectroscopy of surfaces on thick samples in a non-contact method. It enables faster time to data, and cost of ownership improvements while providing correlation to industry standard FTIR databases. mIRage overcomes the IR diffraction limit by combining a pulsed tunable laser with a proprietary optical technique measuring photothermal response of the sample in a fast, easy to use manner. mIRage relies on the decade of expertise in photothermal physics that Anasys Instruments, the company that preceded Photothermal Spectroscopy Corp, and its collaborators have built up since starting the research on their AFM based nanoscale IR spectroscopy platform. Dr. Curt Marcott, former Research Fellow at P&G and one of the world-renowned experts in IR Spectroscopy, stated that “Having been personally involved with some of the major advances in IR over the last 40 years, I believe that photothermal IR spectroscopy via the Mirage product might very well be the biggest advance in the field of IR that I’ve seen in my lifetime. I believe that this will substantially expand the scope of problems that can be addressed by IR spectroscopy “.